I picked up the Becca Lowlight Sculpting Perfector on yet another Space NK whim, (they're the best whims, aren't they?) expecting great things as a lover of their super popular Shimmering Skin Perfectors. This contouring cream is dubbed on their site as a "adaptive and blendable, combining the warmth of skin-authentic undertones with the coolness of a natural shadowing effect". 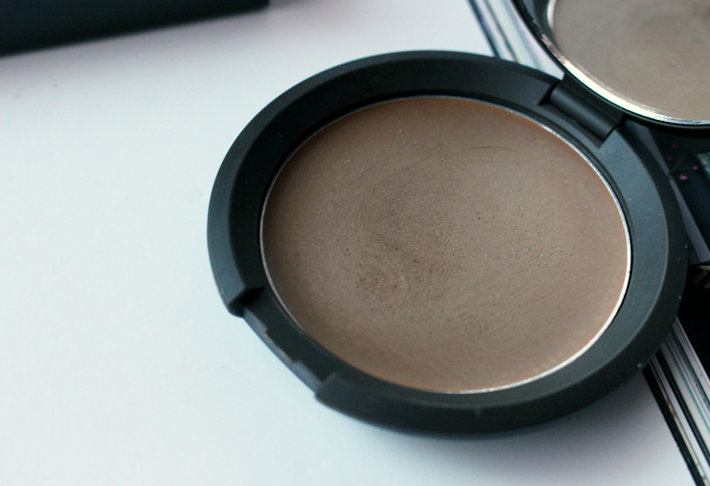 Despite its daunting appearance in the pan, it does adapt to your skintone, and with blending will look very natural on even the palest winter skin. While it is called a cream, I've found it to be quite waxy in texture, and can drag a little when applied with certain brushes. I apply this straight after my foundation, using my finger to leave a stripe of colour (just enough time to let panic set in) just under my cheekbone. After doing my brows and eyes I return to the product, which should have meshed with the foundation and after some more blending with my fingers and a clean fluffy brush the look will be akin to your skin, and look completely natural. The colour is absolutely perfect, and for anyone like me, that uses all cream products for a fresh, dewy look, this will become your new best friend.